The Red Sea is one of the world’s least studied regions when it comes to whales and dolphins – until now. A report was released recently that brings together historic records and the latest information on a range of the sea’s mammal species. This will supply some of the information needed for science based conservation measures. I interviewed Giuseppe Notarbartolo di Sciara, one of the reports’ authors who is also among the region’s most respected marine mammal specialists, on the findings and their implications. What is special about the Red Sea and the habitat it provides to whales and dolphins? While huge progress has been made globally in our ecological knowledge of marine mammals, this hasn’t been the case for the Red Sea. With the exception of dugongs, very little is known about the Red Sea’s mammals. This is one of the main reasons we put this report together, conducting and collating research from 1983 to 2017. Among the things we learned was that the fertility of the Red Sea’s environment affects marine mammal presence in the region. Life in any ocean starts from the water’s productivity. This is the ability of phytoplankton (microalgae) to bloom because of the nutrients contained in the water, like phosphates and nitrates. This is triggered by upwelling currents that bring nutrient-rich deeper waters to the surface. This fertilises the phytoplankton, which need sunlight. The phytoplankton bloom gets eaten by zooplankton, which are then eaten by little fish, and so on up the food web. Such upwellings are rare in the Red Sea. This makes it a hard place to live for the great whales, which need big swarms of krill, small crustaceans, to survive. This could be why only a few whale species have been able to colonise the Red Sea. We also found out more about how dolphins – which are known collectively with whales as cetaceans – survive in the Red Sea. 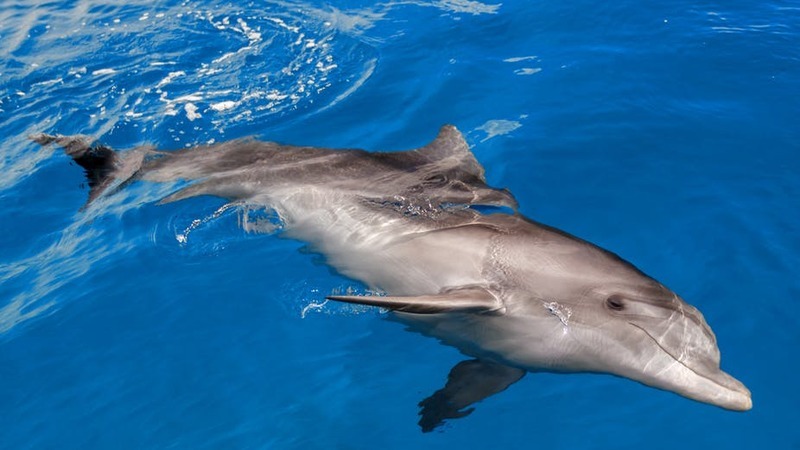 The environment is better for smaller dolphin species like spinner dolphins and pan-tropical spotted dolphins. Spinner dolphins take advantage of a community of smaller critters living in what scientists call the deep scattering layer. It’s mostly made up of small crustaceans, fishes and squid. They live in a narrow layer that rises towards the surface at night to feed, and returns to the depths during the day to shelter. It provides the critical source of food for the dolphins to tap into in an otherwise poor marine environment. What threats do cetaceans face in the Red Sea? What worries me most is that the Red Sea is crossed by a huge amount of ship traffic carrying oil. It is a key strategic channel: an estimated 4% of global oil supply passes through it. The proportion sounds small, but it represents a vast amount of oil. A major accident would be disastrous for marine life in the narrow Red Sea. An immediate and obvious threat today is disturbance by tourists. For example, spinner dolphins enter a reef in an area known as Samadai, on the southern coast of Egypt, to rest. They do this because they’ve been hunting at night and the reef gives them protection from sharks during the day. The tourism industry discovered this and started to advertise swimming with dolphins in the area. It very quickly became a mess, creating an outcry on social media calling for people to stop bothering the animals. Fortunately, the Egyptian government took action and I helped to explore the situation and draft a plan. There is now a large area of the reef that is completely off limits to tourism, and the dolphins have enough space to rest. Unfortunately these situations aren’t always so well managed. Another area called Sataya, also in Egypt, has no management plan and the spinner dolphins are very stressed. It’s likely the entire reef area will be taken over by people and the animals will be pushed out. In terms of fishing, I’m aware of situations in which particularly Yemeni fishermen travel widely across the Red Sea to hunt sharks for the Far East fin trade. I know that they have been using dolphin meat as bait for catching sharks. But we really don’t know how big this practice is or its impact on dolphin populations. It would be great to have a model in the Red Sea similar to the one applied in the Mediterranean and Black Seas. Since 2002 there’s been an agreementbetween most countries bordering those seas. It commits the coastal countries to protecting those seas’ cetaceans. Something like that would be extremely helpful in the Red Sea, and raise their visibility at the policy level. It’s also important to protect marine mammal habitats in the Red Sea. This could come partly from the identification of important marine mammal areas, work that’s being done by a task force established within the International Union for Conservation of Nature. The identification of the areas is based on specific criteria, and is modelled on earlier work on birds. The areas are critical for some aspect of a species life, for example feeding, breeding or migrating. Identifying them gives decision makers an easy tool to help select which areas need protection. The task force is in the process of identifying these mammal areas in large portions of the southern hemisphere, and there are plans to do this in the Red Sea in 2019.